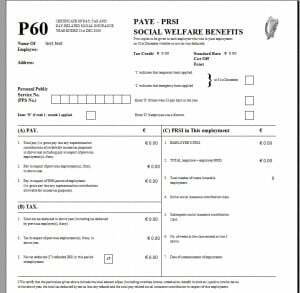 If you are currently in employment, your employer has probably sent you your P60 in the last few weeks.If you have never seen a P60 , it looks like this. But importantly: Only what we have told Revenue about our circumstances. Most of us will receive our P60s in February and many of us will quickly put them in “the drawer”, not really knowing what purpose they serve. form now in “the drawer” can be used to claim your tax back from 2011. That’s right – take it out and keep on reading…You might be pleasantly surprised! All workers in Ireland can apply for a tax refund. of euro go unclaimed every year in tax reliefs and overpaid taxes. Following are links to the most populars items you can claim for. Each link explains what charge(s) qualify, and how you can claim for them. Did you get married in 2011? I also found this list of “flate rate expenses ” http://www.revenue.ie/en/tax/it/leaflets/flat-rate-expenses.xls relevant to a variety of occupations, do check it out, you may find out there is a flat rate expense you can claim for. Good luck sorting out those bills and hopefully you’ll get a nice refund..